Second graders from Jackson Street School circling up at the start of a field trip. Just under four hundred (398!) 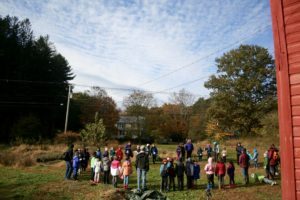 Northampton elementary students stepped off of the bus at Crimson & Clover Farm this fall, ready to get a little dirty while learning about the workings of the farm. 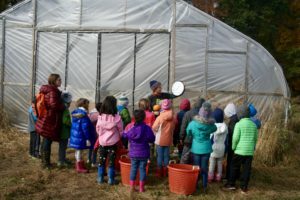 Our Grow Food Kids program welcomed twenty-two classes, more than half of all K-3 students in the district, to participate in these no-cost field trips. After gathering up in a circle with our field trip leaders, Ellena and Hazel, groups then headed out into the fields to explore and learn. The general structure of the farm tour was the same for all classes, with variation in the lessons according to grade level. Kindergarten and first grades harvested carrots to bring back to school. In the carrot field they sampled pieces of freshly dug carrots along with daikon radishes. A few classes had the chance to try raw chioggia beets. A kindergarten group from Ryan Road School brought carrots back to school to make carrot muffins as a class. Many students asked for seconds on kale! 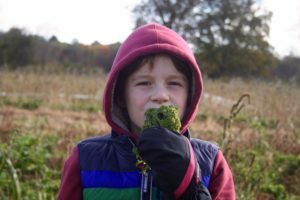 Second and third graders harvested kale to snack on as they walked through the farm, and some to bring back to school. One second grade class from Jackson Street School went back to school and prepared kale salad with kale that they picked. 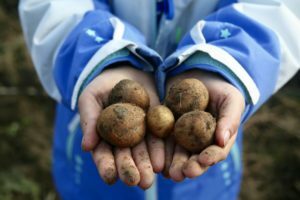 Second and third graders learned about production and consumption on the farm as they helped dig up potatoes in the field. They carried full buckets of potatoes up to the farm store where the potatoes would be sold to CSA members and shoppers. Hazel and Ellena getting in the spirit on Halloween. distance) and took turns passing around bee equipment and honey comb. And as a parting treat, they even got to sample some honey! 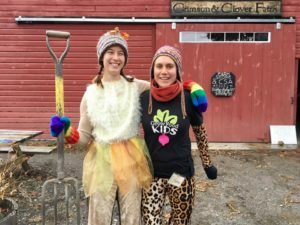 Ellena Baum, Grow Food Kids’ Lead Educator reflected on the series, “What an awesome fall! After every field trip, when we had waved goodbye to the school buses pulling out of the parking lot, whether the sun was blazing, or the air was just above freezing, I couldn’t help but smile as Hazel and I recounted the morning’s events. It was so much fun to share what I love about being on the farm with the students, teachers, and parent chaperones who visited. Ellena and a group of second graders, discussing the difference in temperature outside and inside the greenhouse. 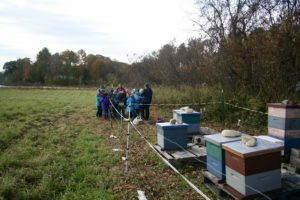 These fall field trips were made possible by financial support from the Massachusetts Department of Elementary and Secondary Education, the Bunny Rattner Foundation, and the Rotary Club of Northampton. We are grateful to the late Rep. Peter Kocot and the retiring Reps. John Scibak and Steve Kulik for the state funding, and to our friends at Crimson & Clover for opening their farm to us as to use as a classroom and for generously donating produce.